Special-effects software developer Color-Logic has commented on its collaboration with HP at this year’s drupa print trade show, which saw the two companies pool their technology to create a commemorative drinks can shrink sleeve. “The shrink sleeves were printed on an HP Indigo WS6600 digital press,” explains Color-Logicdirector of sales and marketing Mark Geeves. 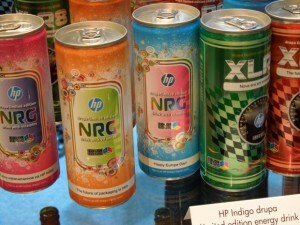 “In just a few hours turnaround time from job creation to final product, thousands of sleeved cans were produced – each unique and printed using variable data. The printed sleeve material was formed and seamed on a Karlville seamer.” The sleeves were applied using the STEAMBOX PRO, automatic shrink tunnel developed by Karlville.